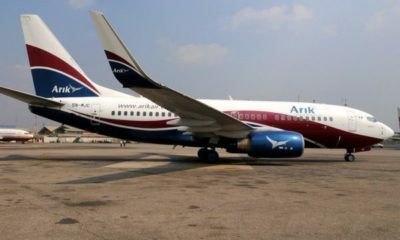 Two Arik Air planes on Tuesday “brushed” each other while maneuvering out of the apron at the General Aviation Terminal (GAT) of Murtala Muhammed Airport, Lagos, Vanguard reports. As a result, the two planes had their wing tips damaged and have been grounded to allow further investigations into the cause of the occurrence. Two of our aircraft, Boeing 737-800NG were this afternoon (yesterday) involved in a wing-tip brush at the General Aviation Terminal, GAT, of Murtala Muhammed Airport, Ikeja, Lagos. One of the aircraft, 5N-MJP, was marshalled out of the ramp for a scheduled flight, when its wing brushed that of another aircraft, 5N-MJQ, parked on the ramp. There were no incidences as the safety of passengers was not jeopardized. We have grounded the two aircraft and are looking into the incident. Air ARIK ooooooo hmmmm they just need to ho outta service/business period, point blank.com it’s a lot going on with them & their employees & their poor service..
ATL’s finest you have no idea what you are saying. “two Arik planes mildly collide” keeps making me think of my children’s new eyebrows. Lord, this too shall pass. you know the eyebrow thing nah, they’re all doing it.